“The new fendering system is very important as it will allow her to land at more locations around the River Fal than ever before,” said Cornwall Ferries managing director, Tim Light. 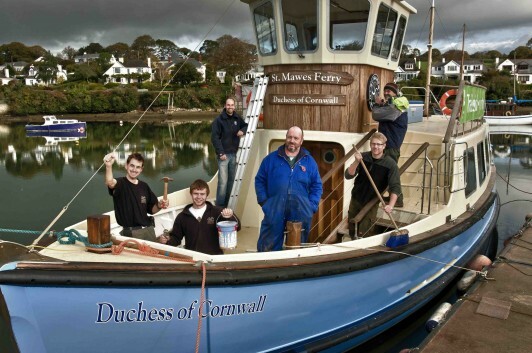 Launched by The Duke and Duchess of Cornwall in 2008 and built from wood by using traditional methods and materials the 100-seater ferry is the company’s flagship and runs between St Mawes and Falmouth, seven days a week, all year round. Dave Cockwell, who completed the works, said: ”Its been good to get the ferry out the water and give her a refit. Garrick Royle, Cornwall Ferries’ operations manager, also announced that this year in order to help local people cut the cost of transport to and from St Mawes and Falmouth, they will be able to travel for £1 each way between now and the end of March on Tuesdays and Fridays. The special locals offer is only valid for residents living in the postcodes TR2, TR10 and TR11.